Automate the release process and allow your experts to focus on coils with quality deviations. We make your terabyte data easy to use. Avoid deviations in process lines before they show up in quality. QuinLogic is one of the most innovative German ‘Industry 4.0′ companies. 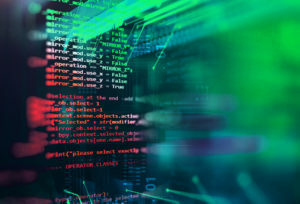 To enable industrial mass production and at the same time highest flexibility, QuinLogic has developed software products by applying latest generation of computing power and storage capabilities. Based on this technical evolution, the experienced team of QuinLogic provides an “easy to use” quality assurance solution for steel and aluminum mills. It is already in daily operation in several high end flat rolling mills worldwide. The QuinLogic Software secures reliable slab/plate/coil quality for the challenging markets e.g. for automotive-, airplanes-, wind energy-, high strength- and wear resistant material grades. And it also provides proactive support, to immediately address production problems and therefore minimize deficiencies in customer products. 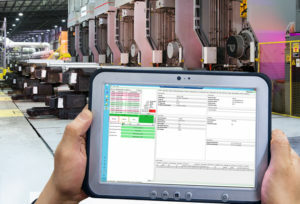 Its seamless communication interfaces to existing MES, ERP and gauging systems allows fully integrated systems in all existing but also new production lines. The key features of a Quality Execution System (QES) are to track quality including decision support per individual piece produced, exchange sequence related information with the MES and ERP systems and feed process related information back into the set-up for the next piece. From all these activities, decision support is obviously the most important and critical activity, given the amount of investments into advanced monitoring and gauging over the recent years. Data from various data bases as well as much raw data as possible must be processed. Data needs to be synchronized. A lot of data is time stamped (in various resolution from milliseconds to minutes as needed to guide the process. Decisions on products are not time based but per square meter and to decide, all data needs to be adjusted to match positions. Decisions are first (a) individual per type of data and then (b) combining several quality characteristics. This is essential because a piece of metal may still be good on temperature and reasonable on surface but in conjunction, it’s a block. So, the core of the QES is definitely the data management. As a basis for a long, investment protecting roadmap, QuinLogic has created a Metal Object Model (MOM) as a foundation and backbone for all QES related applications. 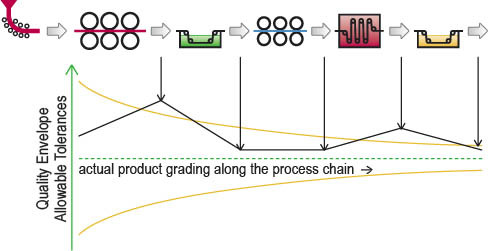 Rule Progression through the process chain. Centralized ruleset management and deployment. 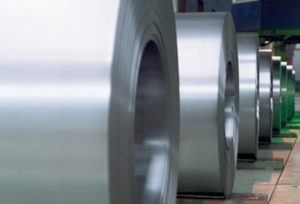 Quality Solutions for flat steel, long products, stainless steel, specialty steels, aluminum, copper and brass. With the given economic situation, customers look twice to verify receiving only the best quality. QuinLogic helps to analyze all of the large amounts of data that our customers and their gauging systems capture about a particular product. QuinLogic synchronizes all data to create a uniform data set per piece of metal that allows the utmost qualification before shipment. Making perfect flat products is not about a final quality approval, it’s about sustaining defined quality levels throughout a lengthy process. Specifications are becoming tighter to the end of the process and options to correct / improve or change intended use of the product are also narrowing. To improve operational excellence, the QuinLogic principle can not only be applied to a particular process step but for the entire process chain and the entire corporation. Our MOM has been geared to support all the genealogy aspects and can therefore even synchronize data among several process steps.